Sitting on the Eastern outskirts of the City of London, Aldgate offers an eclectic mix of office spaces from attractive refurbed offices or commercial space in a variety of historical buildings as well as modern mixed-use developments. 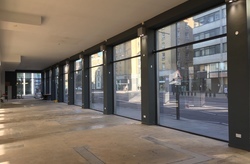 More affordable than its EC1 neighbour this location is home to a variety of businesses and services targeting a wide scope of clientele, as such the surrounding amenities offer high end alongside niche and novelty dining. Transport links are never more than a short walk away as Aldgate has two central tube stations Aldgate and Aldgate East and neighbour’s upcoming areas such as Shoreditch, a prime location when you’re looking to attract investors or clients.